This five mile hike has a fair amount of climbing, one nice view and lots of solitude. Adam enjoys the view from Abbie Point. 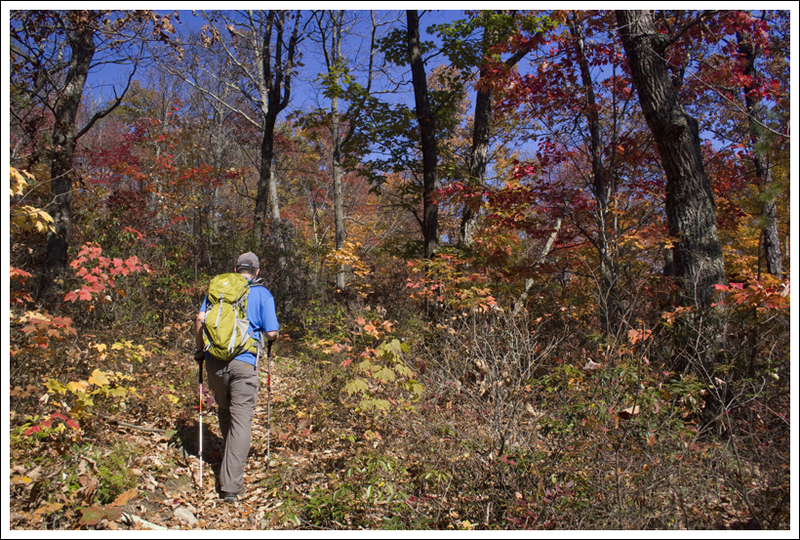 Below: The trailhead for this hike is along Hone Quarry Road; Colorful foliage, A campsite near the ridgeline. 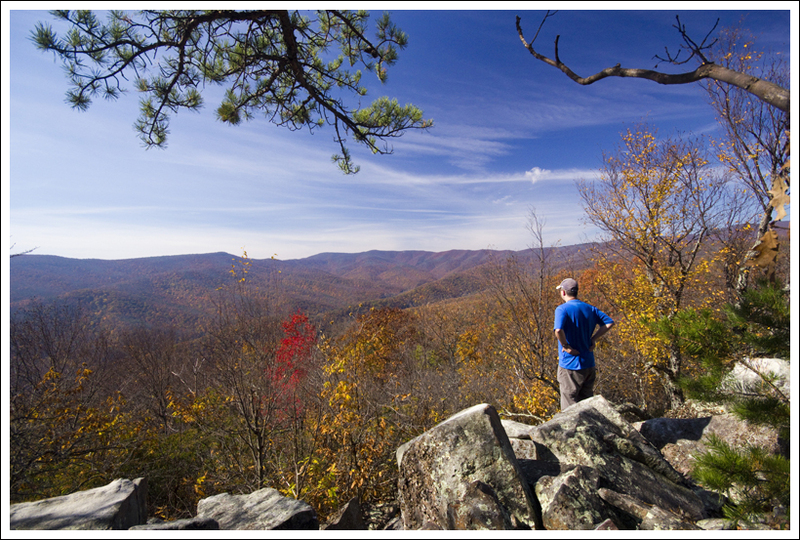 Last weekend, we had a perfect fall day – probably one of the last ones of the 2011 season – bluebird skies, temperatures in the sixties and glorious fall color. We had obligations in Harrisonburg on Sunday morning, so we decided to choose a hike close to town so we wouldn’t miss out on such a nice hiking day. We did some research and decided on the Hone Quarry Ridge Trail. Its five mile length and close proximity to town made it perfect for a quickie hike squeezed into a busy day. The hike was actually tougher than I expected! The climb went uphill without many switchbacks which was a small part of the challenge, but most of the difficulty came from the tricky footing. 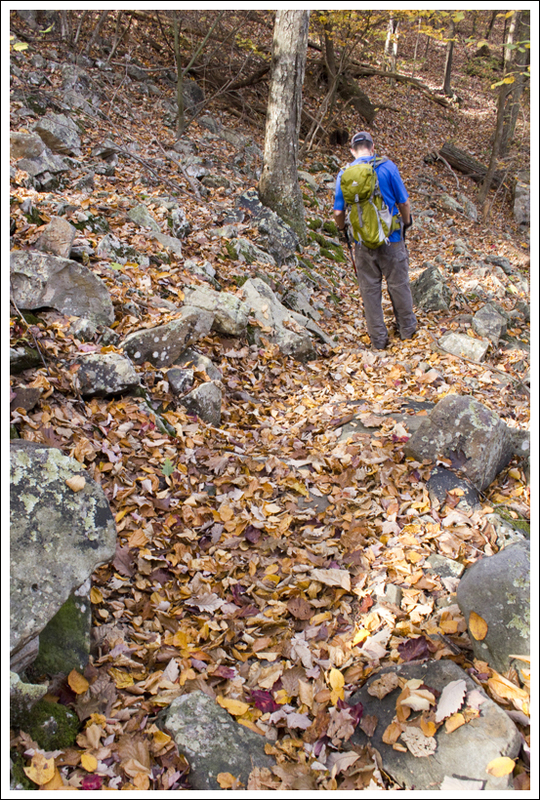 Large sections of the trail were covered with loose, pointy, ankle-turning rocks covered with a deep layer of dry autumn leaves. I was so glad to have my trekking poles. I am sure they saved me from turning my ankles multiple times. 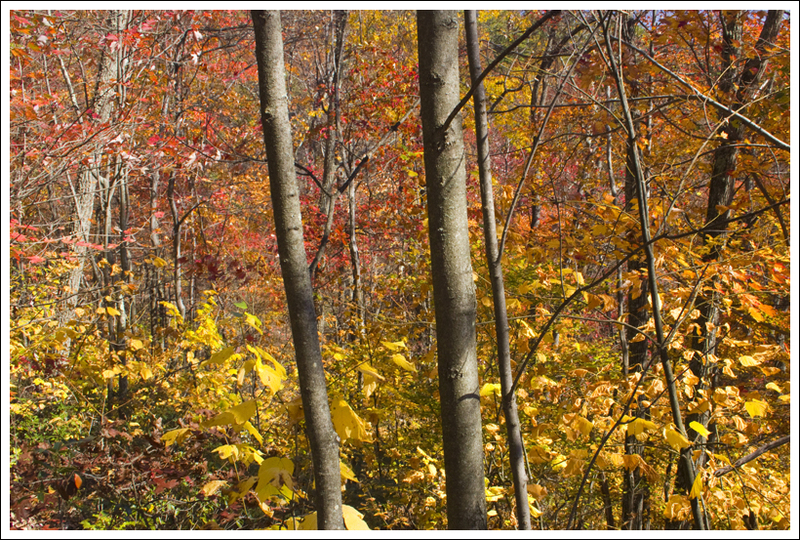 The woods were so colorful – reds, oranges, golds mixed in with occasional evergreens. On the climb up, we caught glimpses of views through the thinning trees. We passed a few established backcountry campsites and enjoyed one gorgeous open view from Abbie Point. Yellow blazes were few and far between. Below: Adam makes his way up the trail; A couple of the signs we spotted along the way. There were several trail junctions that were unsigned. Hiking in George Washington National Forest can be a real adventure. 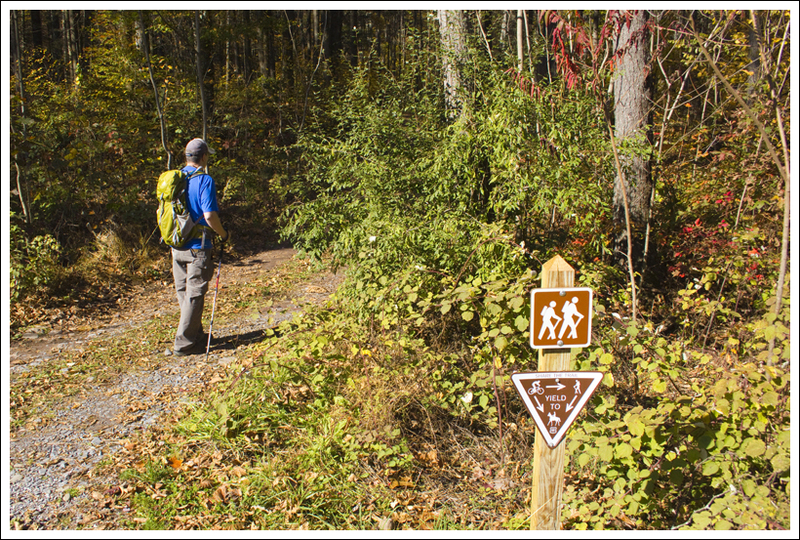 Some popular trails like Big Schloss and Kennedy Peak are as navigable and well-maintained as anything in Shenandoah National Park. While other trails, like Hone Quarry Ridge, have very little foot traffic. Not much attention goes into maintaining these trails. The double yellow blazes were spaced pretty far apart. Trail junctions were often unmarked, leaving us to consult a map and compass to decide our direction. The signs that were standing were in relatively poor condition, slowly rotting into the woods. 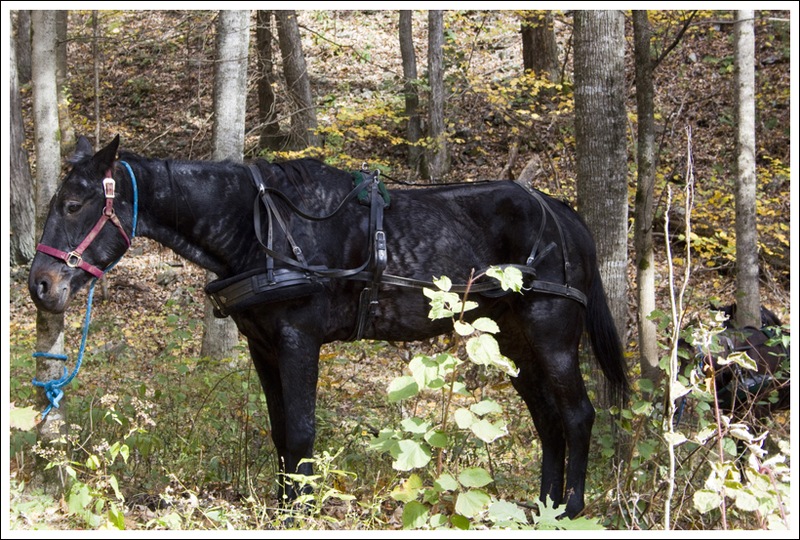 Don’t let this deter you from trying the trail, just be prepared to double-check your navigation. After enjoying the view from Abbie Point, the remainder of the hike was mostly downhill (with the exception of a few short uphills), along rocky and occasionally narrow trail. We moved pretty quickly, because we were hungry and had exciting late lunch plans. If you’re ever in Harrisonburg, don’t miss trying Jack Brown’s Beer & Burger Joint. They have the best burgers made with American Kobe/Wagyu beef and the fries are always hot and perfectly cooked. They always have plain burgers and one specialty burger on the menu. I got a cheeseburger and a Crispin Hard Cider. We sat on the heated outdoor patio and enjoyed our decadent lunch. It was another great hike, with one downside. I got the largest, most painful blister I’ve ever had in my life. I really don’t know how it happened. My boots were the same. My socks were the same. I’m pretty sure I laced up the same. I made it through the hike, but the half dollar sized blister on my left heel has been monstrously painful all week. It was so bad, that I ended up at the doctor’s office on Wednesday to make sure it wasn’t infected. I could hardly walk and I couldn’t wear shoes. We were supposed to hike with my parents the weekend before Halloween, but I still wasn’t ready to wear boots again. It’s finally starting to feel better a week later. As Christine mentioned, this is a hike that I’m glad we have a few modern-day conveniences for hiking since leaves were covering most of the trail. My GPS was handy to make sure we were going the right direction and our trekking poles helped to test the ground out and give some extra support with each step. An example of the rocky trail conditions. The trail started off shortly after the the Hone Quarry campground. After crossing the spillway, we parked our car on the right where there is space for about 3 cars. The trail starts off across the road and you should see a hiking trail marker on a fire road that shortly leads to a wider off-road parking spot. You’ll see the trail marker go over a mound to the left and up the hill to start the hike. In .1 mile, you’ll arrive at an intersection. The left heads towards the Heartbreak trail and the right heads to the Big Hollow Trail. Follow the trail to the right. The trail begins to ascend going up a wider trail that follows a stream along the way. At .8 miles, the trail will hit a switchback and start a steeper ascent up the mountain. At the 1.1 mile mark, the trail will cross a fire road, but keep going straight. 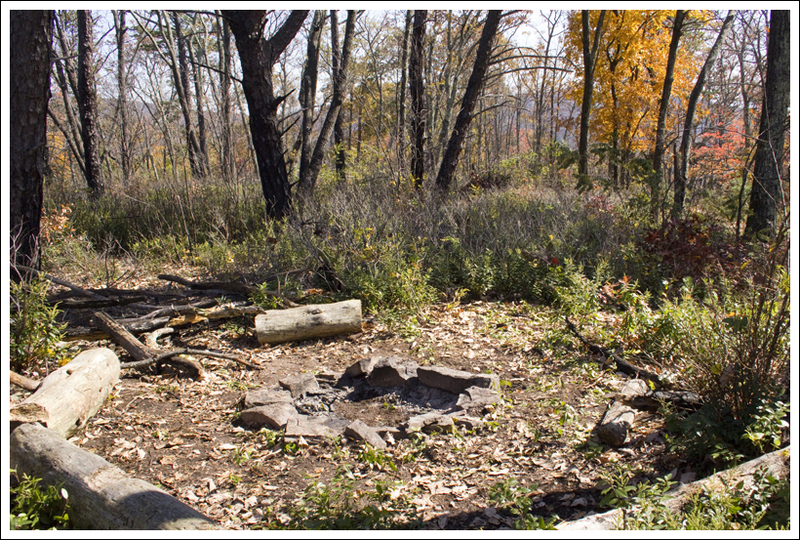 At 1.4 miles, the trail rejoins the same abandoned fire road you joined (you’ll see a small firepit to your left). Take a right here to join the wider fire road. The trail is quite steep at this point as you’re heading straight up the mountain with few breaks in the uphill climb. 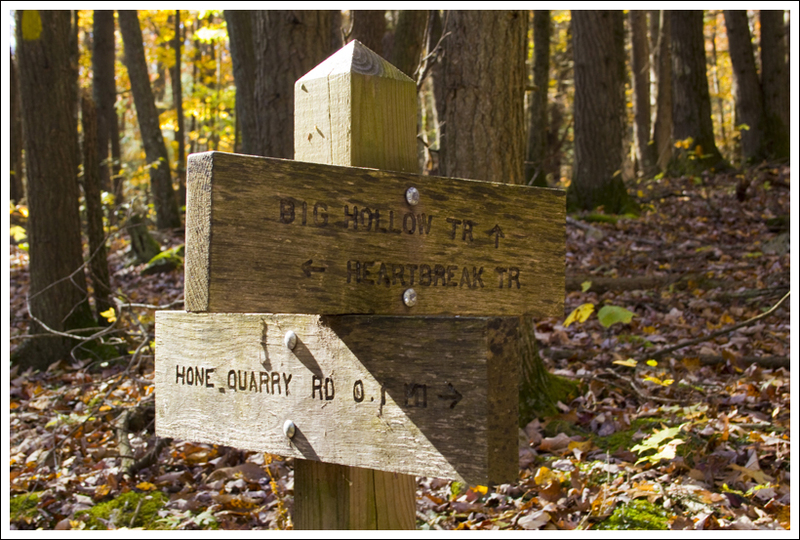 At 2.1 miles, you will reach the intersection with the Hone Quarry Mountain trail. Take a left on this trail and you will see another firepit immediately on your left. The trail descends into a small saddle and then begins a steep hike up to a rocky overlook on your right at 2.7 miles. This is the best point for views on the entire hike. The trail from this point is mostly downhill, but quite overgrown. Much of the trail feels like an animal path through the thick vegetation around. 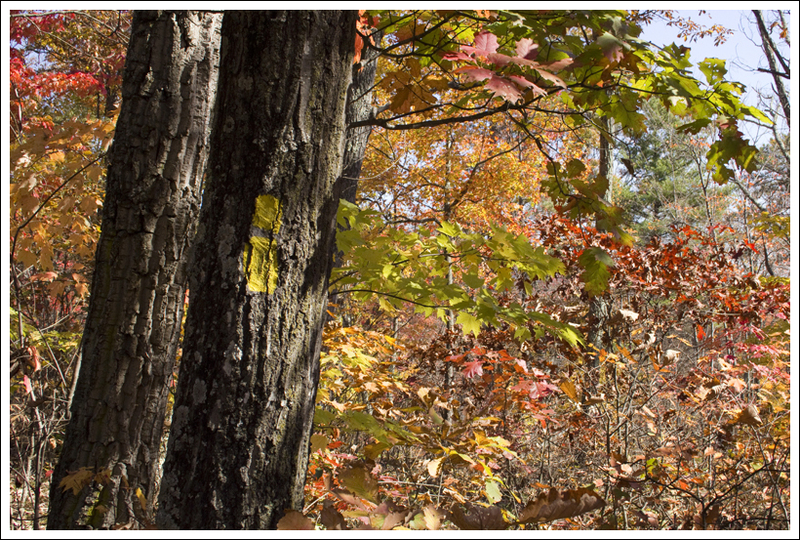 Keep your eye out for the yellow-blazed trail markers. At about the 4.0 mile marker you reach another firepit/campsite area and the trail seems like it splits again (There was a log covering the path straight, so I’m not sure if the trail continues at this point or everything goes to the left). Take a sharp left here (this is now the Heartbreak trail). The trail descends rather quickly through the forest, often through loose rocks, so be careful about your footing! The Heartbreak trail was the most difficult to navigate. The blazes were sparse, so we had to keep hoping we were still on the trail, since leaves covered anything that could be called a path below our feet. Eventually the blazes led us closely to the campground area and we crossed the stream and made our way back to the intersection around 5.0 miles. We continued straight and made our way back to the car around 5.1 miles. 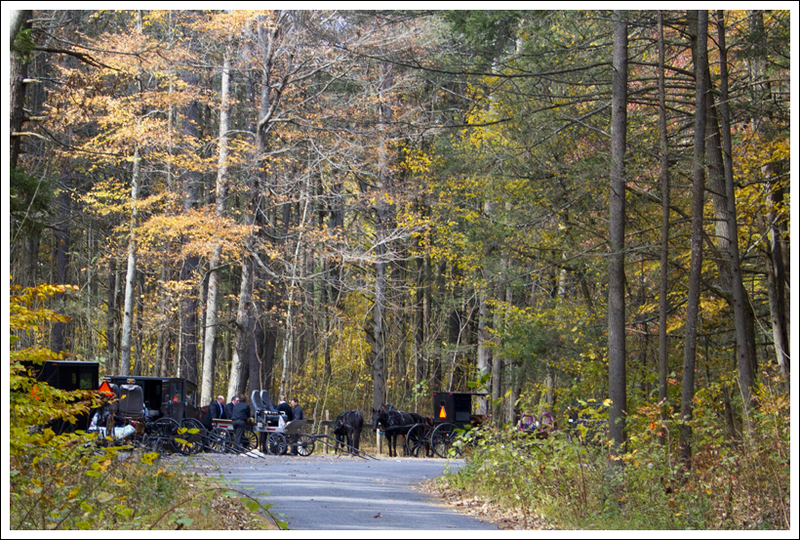 There was a large group of Mennonites picnicking at Hone Quarry. They’re a common site in the Shenandoah Valley. 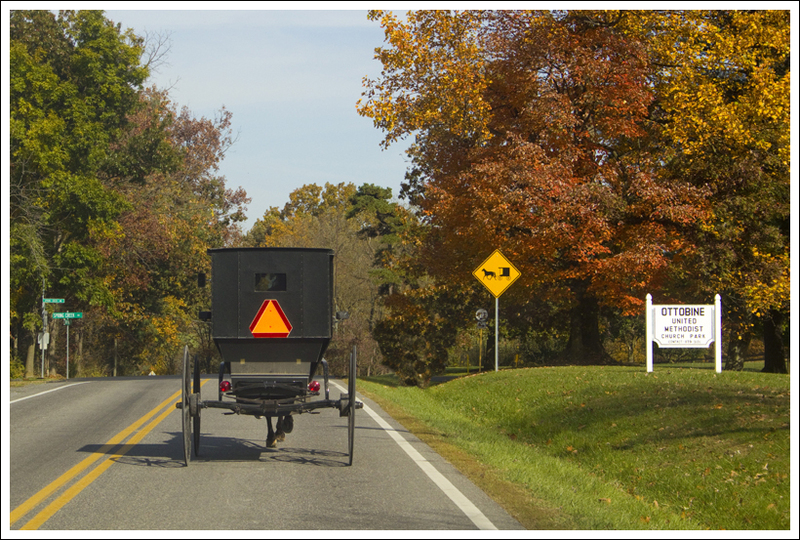 If you hike anywhere west of the city (towards Dayton or Ottobine) on Sunday, you’ll see many families out in buggies and on bikes. Below: A few more shots. I joked with Christine that the Heartbreak trail was aptly named, since I can imagine lots of couples arguing about if they were still on the hiking trail and then breaking up after the hike was over. 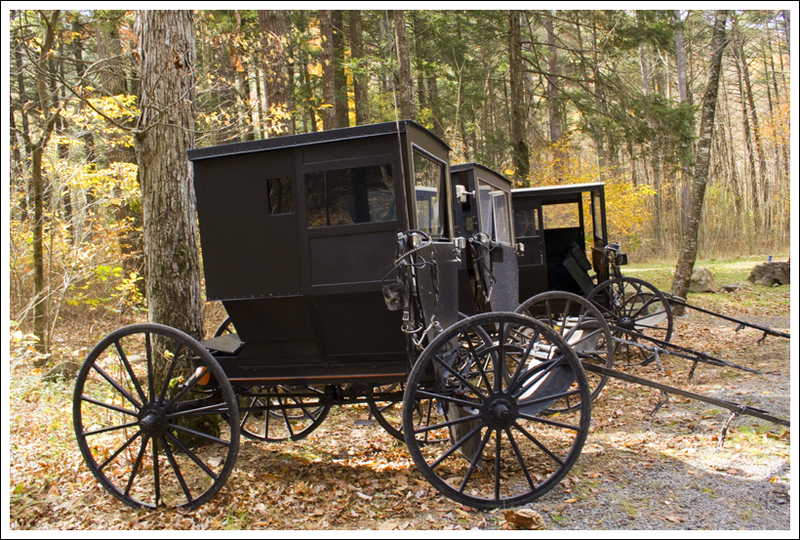 After we got back to the car, we came across a bunch of Mennonite families that were enjoying a potluck picnic. Several of the families were heading off to another hiking trail. The simpler life does make me think of how families may have done this type of thing often in the past. Seeing people hiking in suits and dresses reminds me of old pictures that I have seen of people hiking many of the national parks when they were first being established. Today we have trekking poles, wicking shirts, hiking pants that unzip to become shorts, GPS systems, camelbaks, etc. If you are interested in geocaching, there are a few available on this trail. Gnome Watch – a fun clue that leads you to the nearby cache. Hone Quarry – a standard cache not far from the trail. Cache Advance – a standard cache near the picnic area. Not on the hike, but hard to resist since you pass near it on the drive. While I think this hike was enjoyable, I was expecting more chances to catch some views. You really only get views from the one rocky outcropping. Everything else is obstructed. Elevation Change – 1480 feet. Difficulty – 3. The climbing on this hike is actually pretty steep, both uphill and downhill. Trail Conditions – 1.5. Like many less known trails in the National Forest, the Hone Quarry Ridge Trail is minimally maintained. 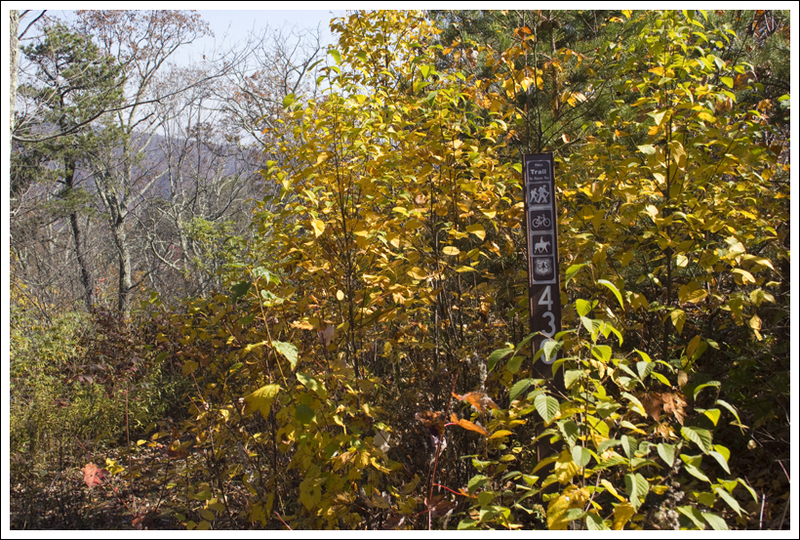 The trail is extremely rocky, and under a deep layer of fallen autumn leaves it can be downright perilous. Views –3. One nice, open view and some nice peeks through the trees along the way. Streams/Waterfalls – 2. The nearly dry stream along this trail has the potential of being quite prettier when there is more rain. Wildlife – 1. We didn’t see anything. Ease to Navigate – 1.5. The trail is minimally blazed and signs are far and few between. We recommend bringing a map and a compass. There are several trail intersections where you might go wrong. Solitude – 4. Hone Quarry is a popular camping and picnic area, but you probably won’t see many people on this hike. On a gorgeous Sunday, at the peak of fall, we saw only three people on the trail. Directions to trailhead: From 33, head south on SR 613/Clover Hill Road. After passing Paul State Forest, the road comes to an intersection. Stay straight and follow the signs to 257/Briery Branch Road. 257 eventually enters into George Washington National Forest. Take the first right on to Hone Quarry Road. Pass by the picnic area and then a small spillway over a stream. You will see a parking area shortly after on the right and the hiking trail is on the opposite side of the road. I was able to make the stream crossings with the help of a walking stick, without getting my feet wet. TR #511 is marked, about the third pull over on the Hone Quarry road to the north of Briery Branch. The mapped trail is blazed yellow. The trail to the cliffs on the east is the second well trodden trail to the east. Earlier there is a fork on the west side of the stream that is little used, but a nice walk also. It can be recognized by three old 2-foot section of trunk and then further on, within sight, two tree trunks fallen across the trail. It ends at the headwaters to the stream. Thanks for the info, Steven! Steve, are you the same man that was in the Navy, was stationed in Guam, and dated my mom Tina in 1970? If so, please get in touch! Sorry to hear of your mom’s passing. Thanks for your reply. I am interested in news from you. Yes, I am that Steven. Will look for you on Facebook. Christine, Adam – Did a plug for your blog today on our HikingUpward Facebook Fan page, you do a great job with your write-ups and photos. Thanks for the mention, Bryce! We use Hiking Upward all the time to choose our hikes. That’s a great fun fact, Abbie! I always wonder where views and overlooks get their names. 🙂 Maybe we’ll come across an unnamed point someday and name it after one of our dogs or something. I normally don’t have any trouble with blisters either, Jason. In fact, this is the first substantial blister I’ve ever had from hiking. I’ve had others from dress shoes, but they’ve been small and not too painful. This thing was the mother of all blisters! I was wearing my new(er) boots. It’s odd that I hiked about 13 miles in them without any issues, and then got blisters. I can empathize regarding the bad blister, Christine. Although in general blisters have never been much of an issue for me, I do have a couple horror stories. I know how bad it can be. Were you wearing your new high-top boots?